Ceraunus Blue (Hemiargus ceraunus) butterflies are common here in southeastern Arizona. 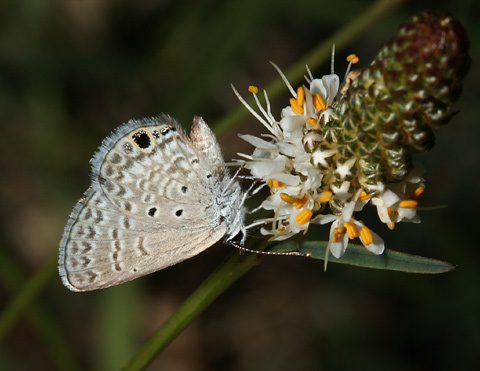 I often see these small butterflies during our summer monsoon season when some of their favorite flowers like White Prairie Clover (Dalea candida) bloom. 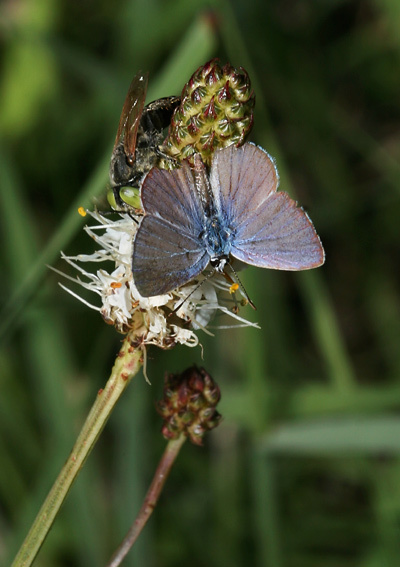 Ceraunus Blue butterflies have light gray ventral wing surfaces with rows of darker gray dashes. There are either one or two black eyespots on the far edge of the hindwings and two smaller black dots near the opposite leading edge of the hindwings. The otherwise similar Reakirt's Blue (Echinargus isola) has an arc of white-ringed black spots on the forewings and the Ceraunus Blue does not. Male Ceraunus Blue butterflies have iridescent light blue-tan dorsal wing surfaces. The females are dark brown above with only a little iridescent blue at the base of the wings. Ceraunus Blue caterpillars feed on plants in the Pea Family (Fabaceae), which are abundant here in the Sonoran Desert. Many of our common desert trees and shrubs like Velvet Mesquite (Prosopis velutina), Yellow Paloverde (Parkinsonia microphylla), and Catclaw Acacia (Acacia greggii) are members of the Pea Family, so it is not surprising that butterflies like the Ceraunus Blue with larvae that feed on these plants would also be common here.